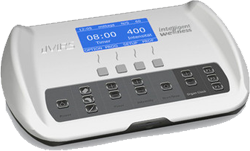 The Swiss Bionic Solutions' iMRS (Integrated Magnetic Resonance Stimulation) Wellness System is an all-natural way to combat chronic pain, stress, depression, insomnia and many other health issues. Years of scientific studies and research have yielded the iMRS pulsed electromagnetic field (PEMF) therapy system, a device that mimics the earth’s magnetic field in frequencies and intensities optimizing human cell function. The secret of PEMF lies in the improvement of microcirculation, the circulation of blood in the smallest blood vessels of the body. The iMRS therapy mat system delivers a specialized therapeutic waveform to target these very small blood vessels promoting improved blood flow and increased oxygen and nutrient supply to tissues and organs. This improved microcirculation increases the human body's ability to heal and repair chronic illness and injury. Contact us today to learn more about our amazing iMRS full body PEMF therapy mat system! Preprogrammed with over 250 protocols directed at effectively treating specific health conditions during differing times of the day. Engineered utilizing 3 pairs of copper coils delivering electromagnetic pulsations to the entire body simultaneously. Includes additional applicators. A pillow and a iMRS probe which deliver highly focused, effective, deep penetrating magnetic fields. The iMRS exposes the body to frequencies within its natural range (.5-28Hz) causing each of your 75 trillion cells to resonate at its optimal frequency. In as little as 8 minutes cells are fully re-energized with effects lasting up to 6 hours. This optimal state activates the body’s natural self-healing ability, while balancing the body systems and helping to reduce or eliminate chronic conditions. With no negative side effects to the earth-based frequencies provided by the iMRS PEMF system, it is the most advanced, sustainable solution to an enhanced quality of life! The iMRS control unit is built with an insulated housing to reduce electronic interference during applications. The universal control unit is used for all iMRS models and operates with an SD card tied to your own serial number for easy upgrades. With automatic applicator detection and three serial ports, all your iMRS applicators are able to remain plugged in at the same time creating an easy transition between mat, pad and probe. To accommodate family households, up to three users can store their favorite settings. Advanced SD card system for easy upgrades or additional applicators or programs such as the iSLRS, iMORE and iGUIDE. The iMRS full body mat is a whole-body applicator that uses a triple saw tooth waveform form to efficiently deliver the full spectrum of human cell frequencies from 0.5-28 Hz. Its padded, bifold design allows for easy folding and storage without compromising comfort. It has six engineered, uninsulated copper coils that increase in size from head to foot, providing a maximum flux density of 45 microtesla. To achieve and maintain an optimal biological environment within the body it is recommended to use the full body mat at least two times per day (ideally morning and evening). The iMRS pad employs a single pair of solid, uninsulated copper coils with a matching number of windings to generate two symmetrical electromagnetic fields with a maximum flux density of 70 microtesla. 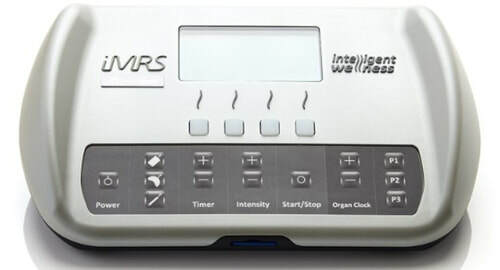 Engineered using proven research by NASA on square wave electromagnetic waveforms, the iMRS pad is designed to deliver effective pain relief, while improving circulation and accelerating healing. Perfect for injuries, post exercise recovery and supporting organ function. The iMRS probe employs the NASA proven square wave and is able to convert electrical impulses to the highest peak intensity delivered by an iMRS applicator, of up to 300 microTesla. The probe provides a concentrated and deep penetrating signal, useful for focusing on smaller, localized areas of the body. Perfect for pinpointing injuries or areas that need extra support. The Integrated Sound-Light Relaxation System (iSLRS) uses brainwave entrainment, a method of mental training that has been used for decades employing sound, light, and color. Often described as a “spa for your brain”, it works seamlessly with your iMRS to melt away stress, improve oxygen circulation to your brain, deepen your ability to enjoy relaxing, restorative sleep, and naturally improve emotional balance without drugs or side effects. With brainwave entrainment people have report improved cognitive function, mental clarity, focus and memory, as well as reduced levels of stress, depression and anxiety. Unlock the power of the iMRS System by scaling your set to meet your individual needs. I have a physically demanding job and can work up to 5 days a week with a torn tendon. This is made possible by the regular use of the iMRS. I have had very little relief all together and in some ways got worse after the procedures. I was introduced to the PEMF system and my life has completely done a 180 since using my PEMF mat. My pain levels have dropped significantly and I am now able to do more than I have in years! Forever grateful to Allie Ochs for patiently answering my endless questions and guiding me on this path that was unfamiliar to me. I have now incorporated PEMF into my physiotherapy/acupuncture practice and my patients are loving it. In only three months I have already regained an unexpected level of autonomy: No more need of cane, capable to make several movements which were impossible to me, able to do my physiotherapy exercises, specific decrease in frequency and intensity of migraines, better digestion, capable to go out to do the grocery shopping and other shopping for hours.